It’s been a spectacularly good week for the city of Manchester, in North West England. Firstly, The Sunday Times flagged Manchester up as being one of the best places to live in the UK. Zeroing in on the city’s Chorlton area, The Sunday Times cited its villagey feel, funky atmosphere, greenspace and excellent schools as offering the complete package. Meanwhile, Colliers International has ranked Manchester tenth in its European Cities of Influence report. In terms of mid-sized cities with a population of two to five million people, Manchester was ranked fourth in Europe. Manchester’s strong talent pool (fed by its top tier universities), workforce catchment area, employer costs, employee quality of life and economic output all contributed to the ranking. Nor is that all. Your Move’s latest house price data shows a rise in house prices in the North West of England, despite falls in many other areas of the country. While house prices in London fell by 2.6% in the year to January 2018, they rose by 4.3% in Manchester. This outstandingly positive picture sets the scene for the launch of a superb new development – Middlewood Plaza. 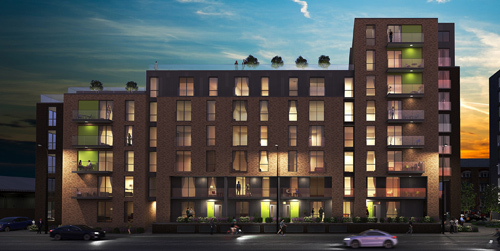 The exciting new development is just ten minutes’ walk from Manchester city centre, providing residents with access to the amenities of both Manchester and Salford. Featuring impressive, split-height blocks of six and nine storeys, the development is home to 125 beautifully designed homes, complemented by an extensive roof terrace with views over the city. Designed to meet the diverse housing needs of Manchester’s urban professionals, Middlewood Plaza offers a mix of apartments, townhouses and duplexes. Secure underground parking and cycle bays are available for residents’ use. In addition, the properties feature smart technology, including whole-house ventilation and sprinkler system protection. The homes are also all fully wheelchair accessible. Middlewood Plaza is set in the heart of Manchester’s Middlewood Locks regeneration zone. The £1 billion regeneration project encompasses a gym, hotel, bars, restaurants, nursery and medical centre, as well as residential accommodation. For investors, Middlewood Plaza presents an opportunity to be part of one of Manchester’s most exciting regeneration areas, packed with potential for capital growth. A leading city both in domestic terms and on the international stage, Manchester has incredible potential. Investors in Middlewood Plaza can be part of harnessing that potential.